I tried some of the Robusto sized examples of this brand after reading your review. I found them to be an excellent smoke from the first draw down past the band. The taste was flavorful and complex but never harsh and never bitter even near the end. The experience reminded me of drinking a dark French roast coffee with accents of rich woodiness and tangy brightness. These prominent flavors decayed quickly on the palette into a wonderful dry sweetness with a long fruity finish that lingered nicely on my taste buds. I also detected the tastes of coco, sweet mocha and black cherry in the mix. Tasty, so tasty! From start to finish I thought this was an excellent smoke – right out of the box – far exceeding its reasonable price point. I can’t wait to experience some of the other sizes of this variety to see what flavors they might reveal. 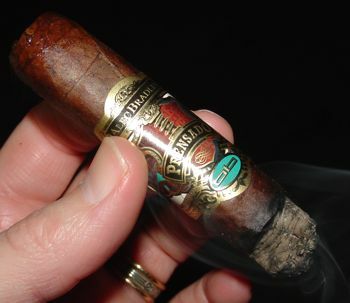 Another informative and excellent review of an exceptional smoke! Thanks. I have labored my way through a box of 20 of the robusto size and found the overall construction to be VERY hit and miss. I know that there can be flaws associated with box pressed cigars but what I discovered with these examples goes beyond anything I have seen in any cigar brand I have tried. 6 out of 20 in the box were NOT capable of being smoked, displaying large linier voids rolled into the filler disrupting the burn. These voids caused EXTREME canoeing during the burn with one example so flawed the burn erupted under the band more than an inch and a half below the tormented and crooked burn line. These were not the cosmetic seconds seen advertised across the internet but were ‘normal’ cigars banded and boxed. The rest of the cigars were fabulous and well within any standard expectations. Disappointing? Absolutely. Artisan construction? Ha. Quality assurance? None. Caveat Emptor? Certainly.